They all gathered at the Light Club Lamp Shop on North Winooski Avenue in Burlington to wait for their big moment: a tattooed couple dressed in black. A white-bearded man in a black vest and top hat. A teenage girl with long brown hair carrying a bag with a tiny kitten tucked inside. Though they differed in age and appearance, these strangers shared a single purpose: to pose for tintype photographers Jeff Howlett and Chris Morgan. The two use metal plates and a unique photo-developing process that dates back to the Civil War era. Like magicians in a traveling street carnival, Howlett and Morgan came to Burlington last Thursday, June 25, carting their own cabinet of wonders: a portable darkroom the size of a steamer trunk, a silver backdrop, a large-format camera and an array of lights and power cords. They transformed a corner of the venue into a makeshift studio and set up their darkroom in a nearby bathroom. This marked the second stop on a Northeast tour for the two North Carolina-based photographers. They visited Burlington on their way to North Adams, Mass., to work their magic at Wilco's Solid Sound Festival, which concluded this past weekend. After an appearance in Brooklyn, the Queen City was a natural stop for Howlett, a former Vermonter who played in bands including Five Seconds Expired and Non Compos Mentis in the 1990s. He codirected the acclaimed 2013 film A Band Called Death with Mark Covino. Howlett and Morgan said they hoped to return to Burlington to teach a tintype workshop in the near future. Both photographers call themselves "wet-plate collodion artists." Morgan has been producing tintypes for about 15 years; Howlett for two. Owner of Howlermano Photography, Howlett met Morgan in a North Carolina photography group last year and discovered their shared love for tintypes. They began setting up their portable studio at venues from tattoo parlors to festivals. Their first gig together, Howlett said, was the Hopscotch Music Festival in Raleigh, N.C., last September. "Truthfully, it's a blast," said Morgan. "Jeff and I love meeting people and showing folks the process." That process, which employs a metal (not actually tin) plate coated with dark enamel, was invented in the mid-19th century. 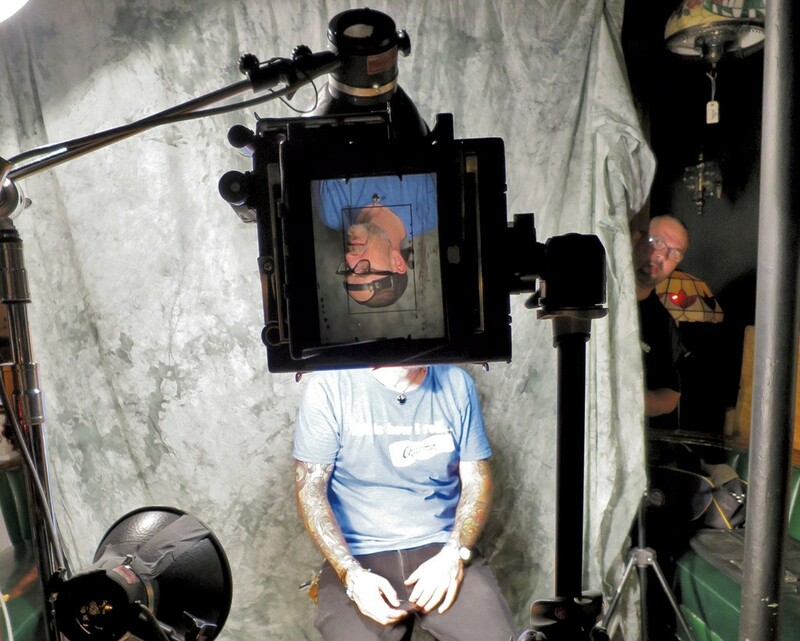 The metal plate is placed in a large-format camera, and the image is captured upside down and in reverse. It is then processed using a mix of chemicals including ether and potassium cyanide, the latter of which serves as a fixer. Initially used in photography studios, tintypes became a favorite of carnival and street photographers because they could be quickly developed and handed off to customers. The format was used to produce many Civil War and Wild West images. These days, tintype photography is making a comeback. Why? Howlett said he was attracted by the opportunity to create something tangible that can be passed on. "The plate has a certain smell to it," he said. "There's a varnish we have that has lavender oil in it. Being able to hold it in your hand and smell it — you can't do that with a digital photo." At the Lamp Shop, Howlett and Morgan worked together seamlessly. Standing behind the camera, Howlett acted as photographer and director, posing his subjects on a stool. He placed each metal plate on the camera, where the image was captured, then passed the plate off to Morgan, who carried it back to the makeshift darkroom. Morgan's head and upper body disappeared behind a black curtain as he guided the metal through the developer, stop bath and fixer. As Morgan set the plates out to dry, Howlett arranged his next subjects on the stool. A screenwriter-filmmaker wanted to be photographed with notebook and pen in hand. A pair of white-haired musicians clutched their instruments. A woman in a long dress cradled fresh flowers in her arms. Each had about five minutes in the spotlight. Though it took only a second to capture the image, arranging props and poses required more time. By 8:30 p.m., the café was bustling with tattooed musicians, artists and others, many of them decked in vintage gear. While waiting their turn, they sat and observed the array of characters on the studio's "stage." The waiting list quickly swelled. Though the line moved slowly, the atmosphere in the bar was light and playful. People came to pose for many reasons. For Robert Resnik, a Burlington musician and host of Vermont Public Radio's "All the Traditions," posing for a tintype meant an opportunity to time travel. "I love old photos, and I like to dress up in an anachronistic style," he said. Jordan Douglas, a photography professor at Saint Michael's College, was drawn by the chance to witness the wet-plate collodion process. "It's analog, handmade," he said. "I love that it's processed in a little, red-lit space. It's got a magic to it that technology doesn't have." 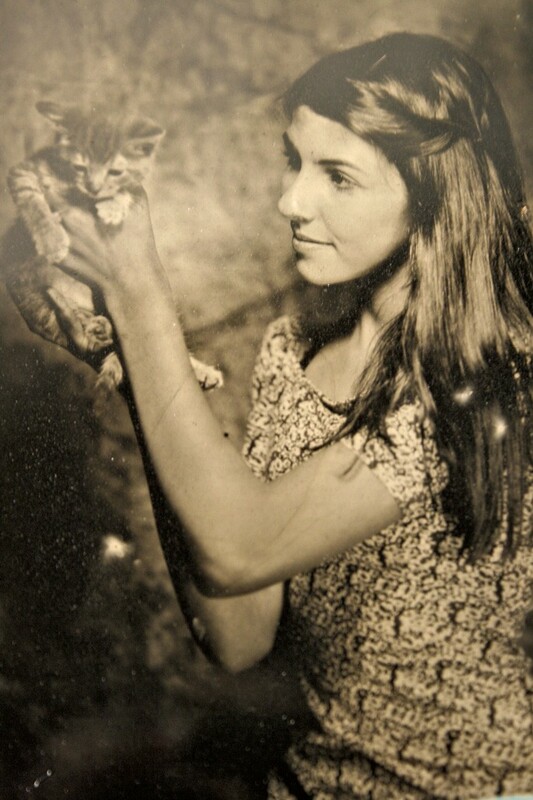 Sophia St. John Lockridge, age 14, said she posed with her kitten for a tintype because "I want my future children to know where they get their cat obsession from." Both of her parents — Jim Lockridge, executive director of Big Heavy World, and Victoria St. John, operations director of VPR — got tintyped, too. Surely many of these images have already become Facebook profile photos, giving the old-school technology an ironic twist. But some will also go on to print: One couple said they'll use their tintype in their upcoming Southern Gothic-style wedding announcement. When the plates emerged from their chemical bath and made their way to their subjects, it was fascinating to see how each face translated onto the metal. Gray hair, wiry beards and facial lines added to the complexity of the images. Blue eyes took on a haunting quality, reproduced as almost white. Blond hair glowed with otherworldly light. Because they're processed by hand, tintypes have their own unique marks, lines and quirks. In Photoshop, so-called flaws might be edited or deleted; in tintypes, they become beautiful. The best part of the process is having a memento that will live well into the future. "Nowadays, the digital files we create will be lost in coming years," Morgan said. "Paper degrades, ink-jet prints fade, but tintypes last. They are real, tangible, something to hold." The original print version of this article was headlined "Tin Men: Itinerant Image Makers Bring Old-School Photo Studio to Burlington"